As we get closer to November 8th election day, the daily news feeds read more like a cliff-hangar of “who done what”. Congress is investigating Hillary’s email server, WikiLeaks is getting ready to release more damning emails, and the most recent Democratic National Committee email leaks show a corrupt pay-to-play government at work where every office and/or ambassadorship has a pricetag. It’s become a roller coaster ride—a cocaine high for news and political junkies alike. Never before has the news been so sad or as entertaining, depending on who you ask. It’s completely polarized entire families as they try to tell each other who lies, who is more corrupt, who will ruin the nation and, ultimately, who they had better vote for if they’re smart. We are a nation with a chronic case of Electile Dysfunction. For over a year now, the mainstream media has accused the alternative media of promoting outlandish conspiracy theories regarding Hillary’s health. 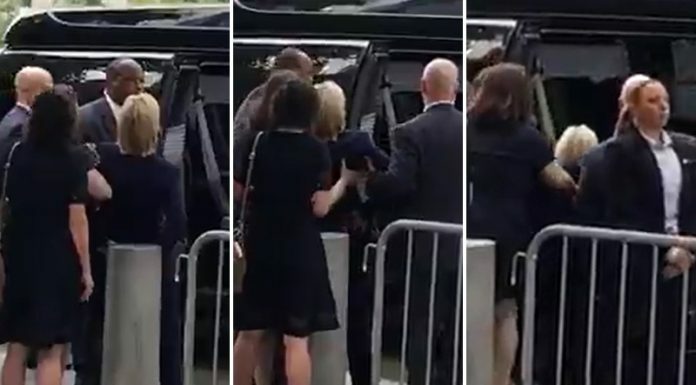 The September 11th video, showing an ill Hillary being propped up and helped into her van, after losing balance and stumbling, finally made the health issue real for the mainstream media. They could no longer be in complete denial. The video is visual proof that something is seriously wrong. Even veteran NBC news correspondent, Tom Brokaw, called for a release of full neurological records on NBC’s Meet the Press. It’s not an unrealistic request for anyone running for the highest office in the land. And due to a public-perceived high dishonesty factor, many are not buying the official story that Hillary is suffering only from dehydration and pneumonia. Is a little truth too much to ask from either of these candidates? Now in a weird twist of karmic fate, the mainstream media is under those same accusations of being conspiracy theorists after embracing and running with the story that forensic pathologist, Dr. Bennet Omalu, believes Hillary is being poisoned by Vladimir Putin and Donald Trump. I kid you not. Dr. Omalu, portrayed by actor Will Smith in the movie “Concussion,” rose to prominence after discovering chronic traumatic encephalopathy in the brains of deceased NFL players. On his Twitter account, he called for a complete toxicology analysis to be done on Hillary’s blood. Most would laugh this off but The Washington Post actually ran with the story, citing Omalu’s “credentials and tenacity are well-known” —as if this alone gives his theory truth and validity. The Post’s reporter lends credence to Omalu’s theory based on an unsubstantiated British inquiry in 2006 that Putin may have been responsible for poisoning former KGB agent, Alexander Litvinenko. Other media outlets were quick to spread the Washington Post story, as shown from a Google search on the subject. Lately Mr. Putin has been accused of a myriad of transgressions. They blame him for all the DNC hacks, even though U.S. security intelligence experts say the leaks were most likely a DNC “inside job.” Now he is allegedly colluding with Donald Trump to kill Hillary. Has the media gone mad or is this just another form of denial? It doesn’t matter what side you fall on, Hillary does appear to have some long-term health issues that are certainly questionable. While Omalu may be mistaken in his Putin/Trump poisoning theories, his calling for a complete toxicology analysis is probably not such a bad idea. I’m sure Hillary’s doctor runs routine lab tests for therapeutic drug monitoring (with results usually available within 24-48 hours), but has she had a full toxicology analysis which could show hidden factors? These results can take weeks or months to get complete results. Hillary could be suffering toxicity from her prescribed cocktail mix of medications. According to Hillary’s medical records, she has been on blood thinners for blood clots since 1998, first Lovenox then Coumadin. Coumadin has a bad rep for serious side effects and many physicians no longer prescribe it, opting for newer and safer anticoagulants. From updated medical records released by Hillary’s doctor on September 14, she is also “temporarily” taking the antibiotic Levaquin (the Levaquin damages lawsuits are rampant). Fact sheets on Levaquin tell you to avoid sunlight and being out in the heat (Hillary should have skipped the 9/11 ceremony). Since antibiotics can have “life threatening” interactions with blood thinners, such as Coumadin, one has to wonder if advice is being given or just not heeded. There are also some contraindications for Coumadin being jointly prescribed with Armour Thyroid, which Hillary also takes for hypothyroidism. Is it any wonder television physician Dr. Drew Pinsky questioned her doctor’s competence for prescribing these meds? The wrong medication combination and dosage can bring on side effects such as seizures, fainting, muscle weakness, nerve damage, suppressed immunology (pneumonia), dehydration bouts, frequent urination, and even diabetes. Some of these symptoms have already been reported in the press. One has to ask if HIllary’ symptoms are side effects from a cocktail mix of medications or is the root cause something more serious? To put rumors to rest, Hillary should have the blood test for Parkinson’s Disease and release x-ray pictures of her CT Scan. Better yet, have an MRI done to give a clearer picture. It should be mandatory that every presidential candidate undergo a complete physical by an independent medical facility. This would prevent false rumors and conspiracy theories. So Mrs. Clinton, if your listening, please have a thorough toxicology analysis done on your blood, release those other tests to show the American public what is or isn’t wrong, and please get better. Maybe then all those conspiracy theorists can finally stop blaming the Russians for everything.